Last Thursday, April 4th the National Energy Board (NEB) announced that anyone who wished to comment on Enbridge’s Line 9 pipeline proposal in Central Canada even by simply writing a letter would need to fill out a 10 page application form within 2 weeks. This is, of course, absurd, since it will take the NEB far longer to review these 10 page applications and decide who will be allowed to write a letter, then it would have taken to read the letters. You can apply to participate using the Application to Participate form that the Board will release in a future Procedural Update. The Board may grant you the right to become an intervenor or submit a letter of comment. As noted above, “all required fields” must be filled out. Similarly, the form itself states: “You must provide all required information in order for your application [to submit a letter of comment] to be considered. If you do not provide sufficient information on this form, your Application to Participate will be denied.” As the Toronto Star points out, there is also some pretty intimidating technical language in the form. “I understand it does look quite daunting,” said NEB spokeswoman Whitney Punchak, who pointed out that people need to complete only the sections of the application relating to issues they believe pertain to them. McHattie sees it as the federal government putting fossil fuels above the concerns of Hamiltonians. “It's outrageous to minimize opportunities for citizen input to the point that they have to fill out a 10-page application to indicate their qualifications before they're taken seriously by the federal government,” he said. Is this the fault of Bill C-38? Is this debacle the result of the language in Bill C-38, as the NEB claims, or could the NEB have adopted a more open and democratic approach? Bill C-38 repealed the Canadian Environmental Assessment Act and replaced it with a new Act (CEAA 2012). CEAA 2012 introduces the new rule that, for certain environmental assessments, only “interested parties” will be able to participate. Interestingly, CEAA 2012 says that the NEB (unlike other government bodies conducting assessments) is not required to consider written comments received from the general public. ... the Board shall consider the representations of any person who, in the Board’s opinion, is directly affected by the granting or refusing of the application, and it may consider the representations of any person who, in its opinion, has relevant information or expertise. A decision of the Board as to whether it will consider the representations of any person is conclusive. It’s pretty clear that the NEB – through its new 10 page application procedure – is implementing the definition of “interested party” and directly affected found in the new CEAA 2012 and in the amended NEB Act. So the procedure is clearly intended to address the changes in C-38. Public engagement is a good thing! Bill C-38 and now the NEB procedures seem to be based on the premise that public participation – at least as it relates to pipelines – is a dangerous thing. This is an undemocratic notion that Canadians must resist. Decision-making that involves the public will result in better decisions that are more likely to be accepted by the people affected by them. If, for particularly contentious projects, involving the public is time consuming and messy, then that’s the price of democracy. 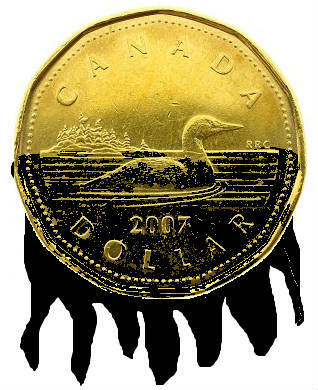 Graphic inspired by Dogwood Initiative's No Tanker Loonie Decals.